A California winery that is keen on solar power, but short on the space for solar panels, now has a unique solution: what is believed to be the world's first floating PV system. 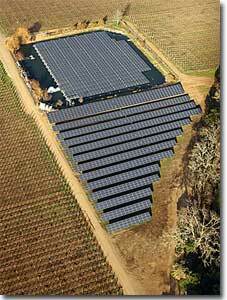 Some may call the floating photovoltaic solar-generation system at Far Niente Winery in Oakville, California, visionary. Others may describe it as thinking outside the proverbial box. Regardless of the description, the design was born from a desire to generate all of the winery's electricity from solar while minimizing the amount of vineyard taken out of production for ground-mounted solar panels, says Greg Allen, who oversaw the solar project and is president of Dolce Winery Inc., a sister winery of Far Niente. "We knew we couldn't put anything on our historic building. It's certainly off limits," Allen says of the winery's home, which was built in 1885 and is listed on the National Register of Historic Places. "The other rooftops weren't compatible or large enough, and of course, trees shade them. We didn't know at the time how many panels would be involved. And from an aesthetic point, everything had to look intentional and thought out." SPG Solar Inc. custom designed and built the mounting systems, except for the pontoons and walkways, specifically for the Sharp 208-watt panels. The system features 1,302 fixed ground-mounted panels on about one acre of land adjacent to the 994 panels mounted on pontoons floating in a one-acre gray water retention pond. Together they produce about 400 kilowatts (AC). The innovative system also may have additional environmental benefits, such as shading the pond, thereby reducing algae growth and reducing evaporation. But Allen says they won't know for a few years whether these prove true until long-term monitoring data has been analyzed. Although Allen and Gopal Shanker, president of Récolte Energy in Calistoga, California, say they're pleased with the outcome, the project wasn't without its challenges. Among those were having to seek permission from the county to build the floating system on the pond and having to unexpectedly run a power line nearly a mile from the PV panels to the winery. "I don't want to dissuade people from doing this, but there are some formidable challenges," says Allen, a Massachusetts Institute of Technology-trained engineer. From the start, it was the dream of Larry McGuire, one of Far Niente's partners, to generate 100 percent of the facility's electricity from solar. Allen worked with Shanker, a solar energy consultant, to review the past 12 months of electricity bills and determine how big a system was needed. Peak demand at the winery was about 400 kW. They also conducted a feasibility study and a payback analysis. "We knew we had to look for some serious real estate, so we knew we had to go look in the vineyard," Allen says. "This is where the alarms started going off in the accounting department." Prime vineyard land in the Napa Valley can run more than $200,000 per acre. That doesn't count what would be generated in grape and wine sales annually from vines on that land. Far Niente and its sister wineries, Dolce and Nickel & Nickel, produce luxury estate-bottled wines for the high-end market. 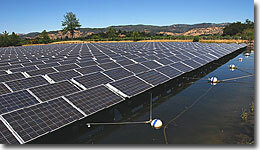 The solar power system at the Far Niente Winery (above) features 1,302 fixed ground-mounted panels on about one acre of land adjacent to the 994 panels mounted on pontoons floating on a one-acre gray water retention pond. Dirk Hampson, another Far Niente partner, came up with the idea of using the one-acre gray-water retention pond as a site. But his proposal involved an elaborate cantilevered structure with guy-wires covering the pond. Allen says such a structure could have easily supported the dead weight of the panels, but was ultimately unrealistic because of wind loading that would generate significant lift behind the panels. Early in the project development, the winery assembled a team comprising an architect, a structural engineer, a wastewater specialist and a solar integrator to consider various approaches to building a solar array on or over the pond. As part of the process, they also had to prove to the Napa County Department of Environmental Management that such a structure wouldn't be detrimental to pond water quality. During spring 2006, Far Niente and Nickel & Nickel each submitted applications to Pacific Gas & Electric for 400 and 330 kW solar photovoltaic systems, respectively, as part of an alternative energy rebate program that the utility administers. In a matter of weeks, PG&E had approved both requests. Once PG&E approves a rebate proposal, the entity has two months to obtain a signed contract with a qualified solar installer or lose the funds. "It just got to the point where we would be dealing with solar installers and construction managers and subcontractors, and we thought of the different pieces of the puzzle we would have to manage," Allen says. "That's why we sought a turnkey operation that would do the permitting, installing and troubleshooting for both projects." The projects, which were bid out as one in August 2006, involved installing solar at both Far Niente and Nickel & Nickel. Allen says they ruled out a floating system at Nickel & Nickel because the gray-water retention pond was relatively small and had a bowl-shaped bottom. Should the water level drop drastically, the pontoons and attached panels would rest on the bottom at less than the optimum 22-degree angle. The one-acre pond at Far Niente had a considerably flatter bottom. The pond stores gray water from winery tasks, such as washing fermentation tanks, floors, equipment or fruit. It is recycled to irrigate grape vines within the nearby vineyard. The pond level can vary, depending on the activities within the winery or whether the vines need irrigation. The maximum level is 12 to 14 feet deep. Should it be drained, the pontoons and panels could sit on the bottom and still maintain a desirable angle. Solar Inc. of Novato, California, partly because of the firm's experience and novel ideas. "We had developed the concept of a floating system and pushed it for a large water district, so we had already been working on a prototype," says Dan Thompson, president and founder of SPG Solar Inc., the system integrator and founder of Thompson Technologies Inc., the sister company that developed the Floatovoltaic system. "It wasn't very well received by the water district. It was probably too futuristic for them." The 330 kW Nickel & Nickel project was pretty straightforward and involved installing a rectangular system of 1,904 adjustable-tilt ground-mounted Sharp panels. The Nickel & Nickel system was constructed first and went live in October 2007. In January 2007, the Far Niente project came up against its first unexpected hurdle. They had hoped to tie the solar array into a meter about 200 feet away that serviced small electrical aeration pumps on the pond. After considerable debate, PG&E told them they'd have to run the wiring from the arrays directly through the meter in the winery-about three-quarters of a mile away from the array. Not only would digging a trench that long be costly, it also would disrupt hundreds of grape vines and other buried utilities. Two of the winery's landscapers suggested running the wires through an abandoned six-inch underground irrigation main that ran from the pond to the winery. Allen says they ran a camera down the pipe, replacing every T and elbow along the way. They then cut into the main every 250 feet to install pull-boxes and then pulled the long conductors through. Shortly thereafter, PG&E raised another concern. "We'd been designing the array size for five months and in January of 2007, it was brought to my attention that we needed to cut the size of our solar system in half or ask for a service upgrade from PG&E and go to a 500 kW transformer," Allen says. "There was absolutely no way that the partners would have anything but a solar system that offset 100 percent of the electricity costs." After contacting PG&E about a service upgrade, the local representative told Allen the current transformer location wouldn't work, but one on his neighbor's property would. Luckily, Allen says, there was a utility easement and a neighbor willing to help, providing Far Niente paid for putting the utilities underground. Allen also had to contact the California Department of Fish and Game for approval to trench across a small stream to get power from the inverter to the winery. After several trips to other agencies, he had the necessary permits. The challenges regarding transmission and utility interconnection were indeed formidable, Allen admits. But he credits the determination of the winery's partners along with a collaborative effort of winery staff and helpful ideas offered by utility engineers for helping overcome them. SPG Solar custom designed and built the mounting systems, except for the pontoons and walkways, specifically for the Sharp 208-watt panels. In the future, Thompson says, the mounting system will be able to accept different brands of panels. The pontoons were fabricated from typical drainpipe with an inner straight pipe, creating two watertight compartments. The end caps were custom fabricated and attached using a unique high-density polyurethane welding technique. 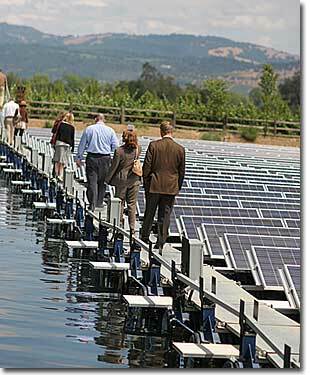 SPG Solar assembled the pontoons on land, then mounted the solar panels. Series of 14 panels were tethered together and launched, much like a boat is launched into the water. A walkway on one side allows workers to check and clean the panels. A small boat steered each series into place after they were launched, then the strings were anchored to the pond floor and sides. Not too long after the system was in place, Thompson says he noticed the pontoons were listing. "We found out quickly those pontoons and their material weren't as highly manufactured as a lot of the other components we used," Thompson says. So he removed the caps, filled the pipes with foam and rewelded the end pieces in place, creating pontoons that were virtually unsinkable. SPG Solar didn't begin installing the panels until July 2007, finishing in December of that year. Far Niente dedicated the system in March 2008. "There were so many opportunities to throw in the towel, but not once was that going to happen,"
Allen says. "The partners were so determined to put in solar." The Far Niente and Nickel & Nickel projects together cost $7.1 million, or 11 percent over budget. Récolte Energy's Gopal Shanker says based on a 6.7 percent energy escalation rate, they'll break even in year 12. Even before the project was completed, Shanker says they had thrown out his financial analysis. "Wouldn't you know, my worst-case analysis was completely irrelevant," he laughs. Far Niente also received a unique financial arrangement from Bank of America Leasing & Capital LLC. The financial institution was in a better position to take advantage of the federal tax credit and accelerated depreciation than the winery, Allen says. So it purchased the solar system and is leasing it back to Far Niente at a "favorable lease rate," Allen says. After seven years, the winery has an option to purchase the system. Allen and Thompson say what is believed to be the world's first floating PV system already has caught the attention of other businesses. In fact, Thompson says SPG Solar and TTI-which trademarked the term Floatovoltaic-are developing a similar, but smaller, floating system for Gundlach Bundschu winery in Sonoma, California. Its system will be about 20 percent the size of Far Niente's.